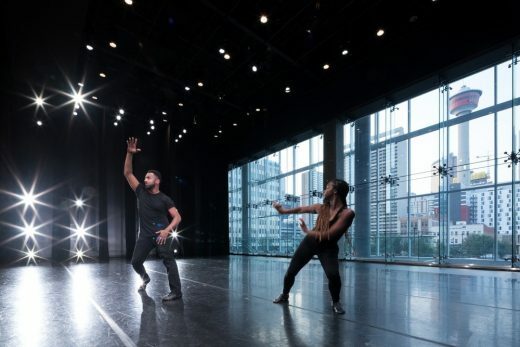 DJD, a professional and recreational dance company, has been exploring how jazz music shapes movement and feeling since its humble beginnings in 1984. Over 30 years later, DJD continues innovating and evolving this art form, growing a jazz-savvy community around the world. 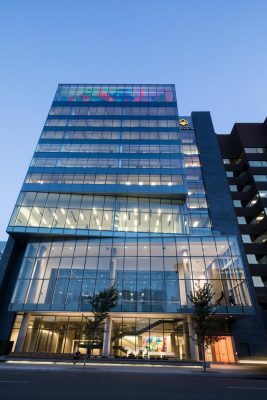 The site of DJD’s new studio is at the Kahanoff Centre, a unique facility in the heart of downtown Calgary, providing space to nonprofits at discounted rates. 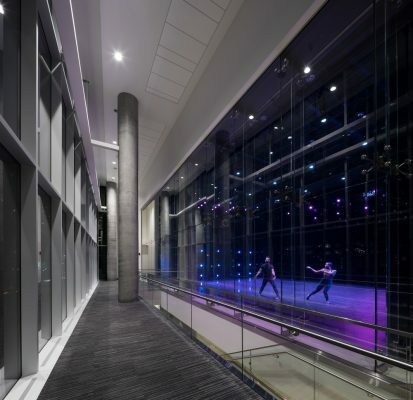 DIALOG’s design emphasizes the fact that it is first and foremost a practice facility for DJD’s professional dancers. 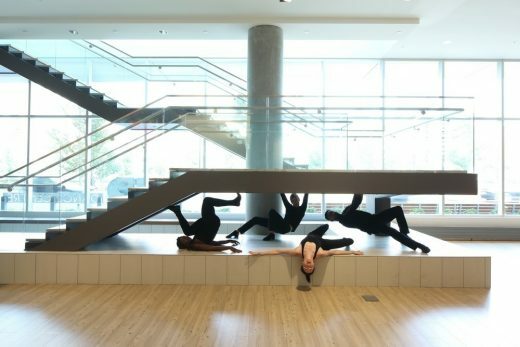 Artistic Director Kimberly Cooper asked for an inspiring space to develop choreography and would be enjoyable to work in on a daily basis. The design responded by turning the notion of theatre inside out by placing a fully glazed back wall to the performance space. 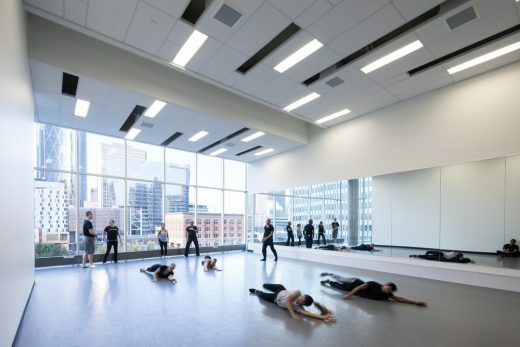 This allows for the city skyline to serve as backdrop: for visitors to view practice sessions, and for the performance to be visible from the street. A chain-mail curtain is available to be drawn over the glazing for privacy within the theater and for projection and other special effects visible from the street. The design gesture focuses on DJD’s initiative to “Bring Dance to the Street”. The studios are presented as separate fully glazed volumes moving independently in form from each other. On a very tight site and bounded almost entirely on all edges, these volumes intentionally push toward the street offering multiple and varied views into the studios, theatre and public function rooms. 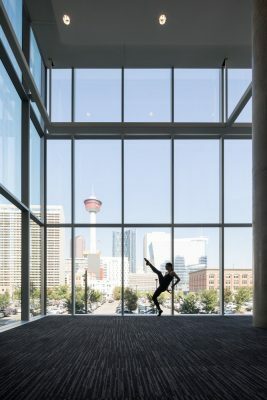 The primary volume is the second floor theatre and lobby extends toward and into the street offering key views for the one way traffic into the event spaces. The intended effect is dance activity showcased simultaneously on multiple levels and fully visible from the street. 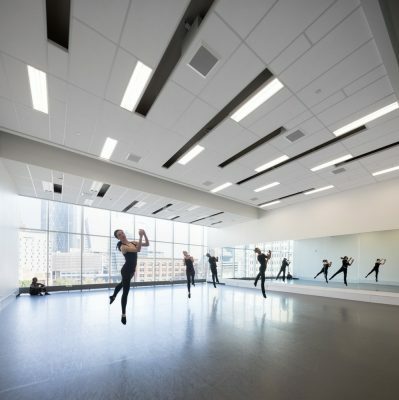 As the facility is most active in the early evening with performances and classes, the transparency and light quality offered at that time of day magnifies the sense of activity. 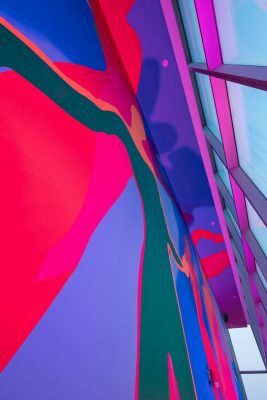 At the top of the building is a two-storey art installation titled Take the Cake by internationally renowned artistic team Hadley + Maxwell. 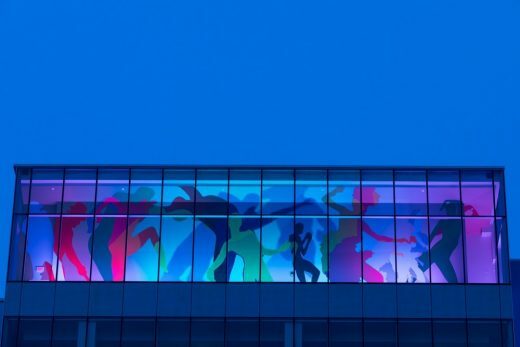 The artists worked with the dancers to make the images using a sophisticated lighting effect, creating an illusion of movement from the figures in the mural, serving as a beacon for the facility animating the skyline. 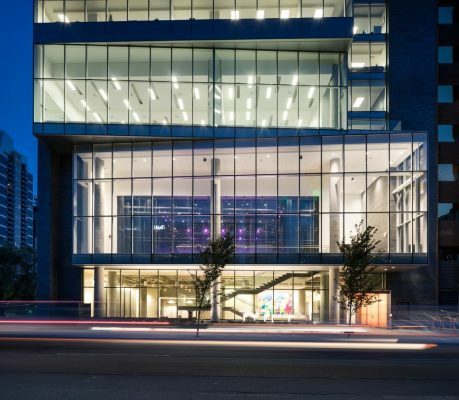 The DJD tenant space is designed to be LEED CI Silver. 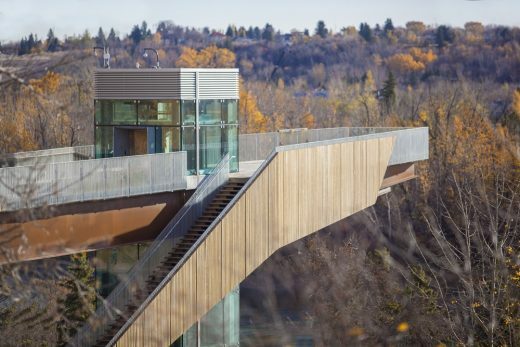 Focus is paid to the durability of the surfaces and materials, primarily exposed concrete, raw steel and glass. Lighting is entirely LED, inclusive of theatre lighting. A low velocity stratified air system is provided throughout for comfort, energy efficiency and for the acoustic benefit of a quieter HVAC system. 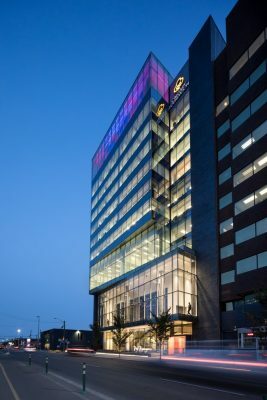 Additional 6 floors of contemporary office space for the Kahanoff Centre. 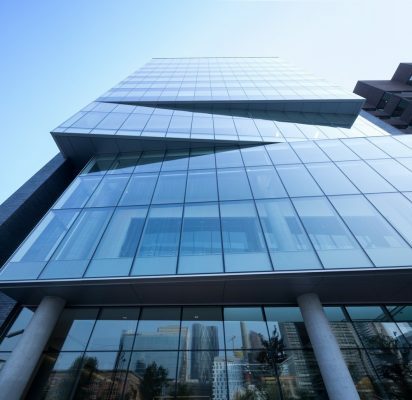 DIALOG illustrates the belief that all great projects start with an understanding of their clients’ culture, context and community to deliver on-brand designs. 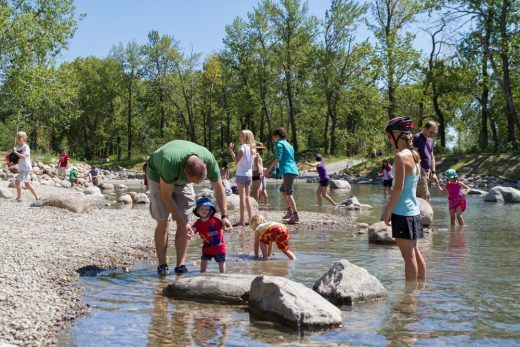 Their “Made in Canada” attitude reflects their vision that design should be meaningful and improve the well-being of communities, including where we work, live, learn and play. 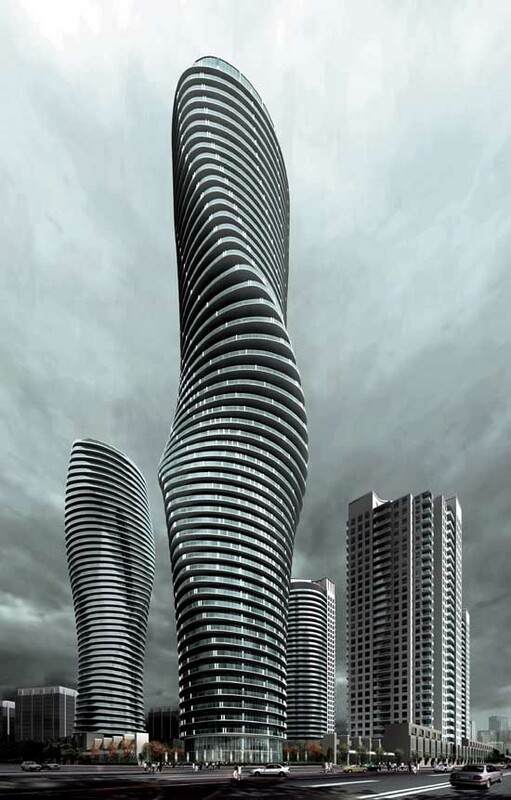 DIALOG’s signature trademark is that every project has a unique story and no two stories should ever be designed the same. Established in 1960, DIALOG is an integrated, multi-disciplinary design firm made up of architects, engineers, interior designers, urban planners and landscape architects. 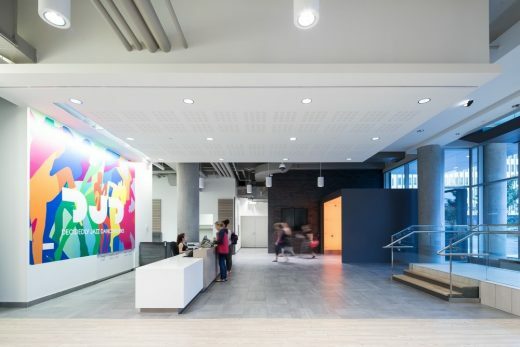 With studios located in San Francisco, Vancouver, Toronto, Calgary and Edmonton, their ability to draw innovation from multiple sectors and apply it to an ever-changing world of design has set them apart from their competitors. Design: W Architecture and Landscape Architecture with Civitas, Inc.